Guardians of Canada’s history warrant a big vote of appreciation for the countless ways our war dead have been remembered. Honouring those men and women in the armed forces who gave their all is evident in the built memorials across Hastings County and by the annual November 11 Remembrance Day services. Large turnouts in Bancroft, Deseronto, Frankford, Madoc, Stirling, and elsewhere come to pay their respect for those who made the supreme sacrifice for the freedom we enjoy. Indelibly etched in each of our minds are the powerful images of a dwindling number of veterans in legion blazers and berets, and all too frequently in wheelchairs. But no matter how cold and sleety it may be they soldier on until their own time arrives when they too will join those we the living remember. And so the great tradition continues. As part of the Canada 150 celebrations there have been numerous reminders of anniversaries involving communities we call home or organizations that have been with us for eons. Historically, it would be hard to argue that any single event in 2017 equalled in scope and importance the 100th anniversary of the Battle of Vimy Ridge. At the enormous cost of 10,600 casualties, the First World War battle waged from April 9-12, 1917, remains one of the defining events in the history of our country. The capture of the ridge (about 175km north of Paris) when other allied troops had failed to do so, is a lasting reminder of the loyalty and bravery of the Canadians in uniform 100 years ago. The men, often not much more than boys in age, came from all walks of life. Many hailed from Ontario — many from northern Hastings County mining and lumbering backgrounds. Regardless of occupation and social status back home, once overseas they fought as one, not only at Vimy but in other First World War battles. One such soldier was Robert (Bob) Taylor, brother to my friend Henry Taylor, long remembered fondly as Bancroft’s Man of the Century. Raised in the Madawaska Valley, each of the Taylor boys took turns working for nearby lumbering companies and Robert as a young man became a cook in such camps. Old Bob was well up in years when we met at his home in Arnprior. He was a wonderful person to interview with tales of early bush days but not once did he mention his First World War experiences. It is often said that war is hell and one can understand why most veterans keep painful memories to themselves. A rare photo of a young Bob in uniform, dating back to 1918 in Belgium, is a reminder of that time. That trees make a fitting tribute for Canada’s victims of war is evidenced by the achievements of the Highway of Heroes Living Tribute program, which began in November, 2015 with the planting of two trees at CFB Trenton and another two trees at the Coroner’s Office in Toronto. Communications director Mike Hurley informed me that a mix of native species numbering almost 17,000 trees have been planted to date with legions playing a vital supporting role. Gerry Foyle, president of Legion Branch #280 in Deseronto informed me of its members’ successful fundraising for a commemorative tree earmarked for the Highway of Heroes route and word from Al Clune also confirmed sponsorship of trees by Trenton’s Legion Branch #110. Their intent is a tree for each local fallen soldier who served in Afghanistan. A significant way of honouring our gallant soldiers has been the planting of Vimy Oak saplings at commemorative sites. The Vimy Oaks story is a special one centering around a soldier, Lieutenant Leslie Miller who, having survived Vimy, collected acorns from an English Oak tree found on the battle-scarred site. He sent these back home to be planted on his father’s farm. A number of these now massive trees thrive on what remains of that property. Today we are indeed fortunate that, in 2014, a group of volunteers banded together as the “Vimy Oaks Legacy Corporation” with a plan to repatriate offspring of those descendant oaks to replace original trees destroyed at Vimy in 1917. The Vimy Oaks Legacy group has made grown-in-Canada saplings available to qualifying Canadian organizations and individuals, among them being Albert College and the City of Belleville. 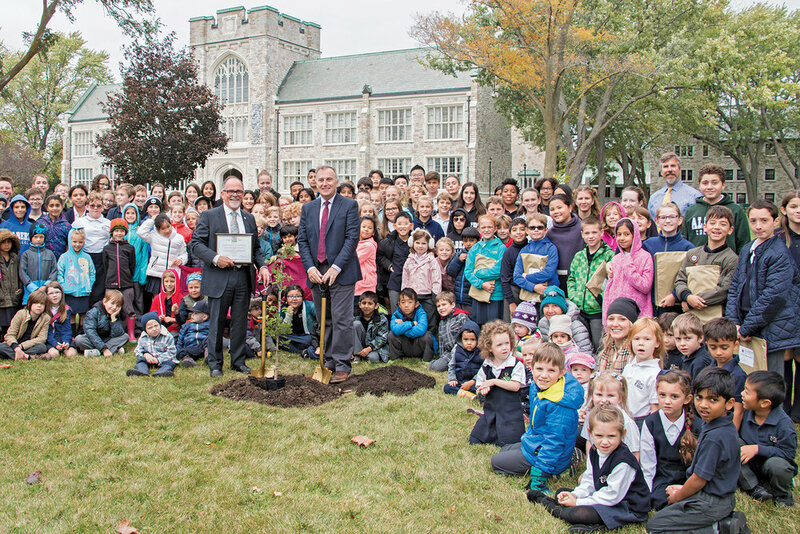 During a ceremony on the college grounds, middle-school student Tara Winter and Bay of Quinte MP Neil Ellis assisted Albert College head, Keith Stansfield, with the planting. It was noted that 2017 is also Albert College’s 160th anniversary year and the college headmaster reminded all present that the school’s memorial chapel is dedicated to past students who served in both World Wars. Any examination of Canada’s military heritage immediately leads to regimental histories and heroic accounts of often unsung individuals. The highly regarded regiment affectionately dubbed the “Hasty Ps” has an inspiring thoroughly documented record of service that does Hastings and Prince Edward Counties proud. And when it comes to military history few Canadian journalists currently are as well-regarded as Ted Barris, who recently spoke in Belleville on the topic of his best-selling book Victory At Vimy. 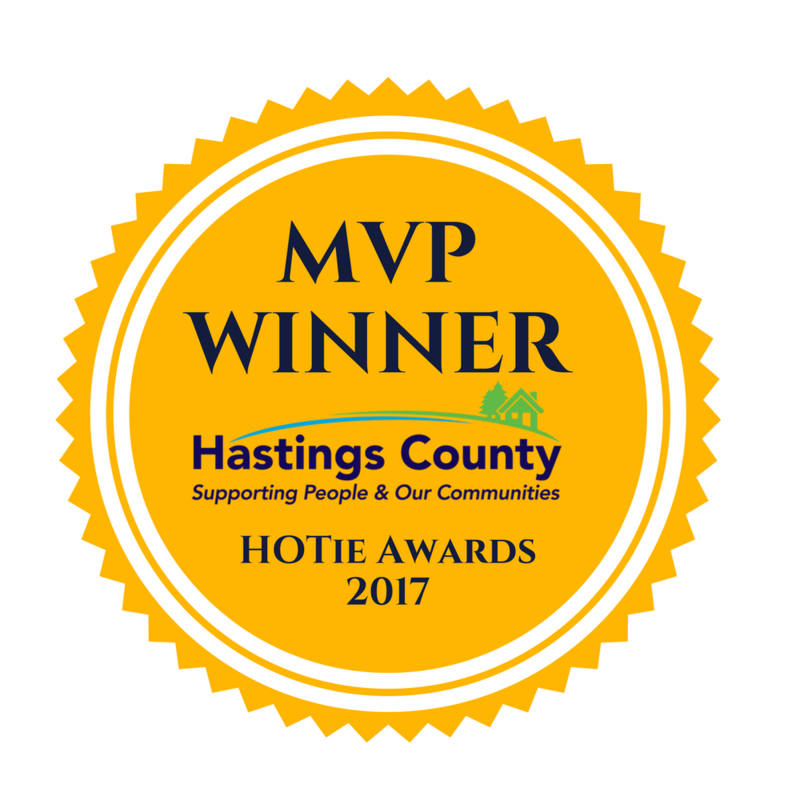 This article would be incomplete without inclusion of a special father and son with strong ties to Hastings County. The father, Angus Mowat, is remembered as a librarian whose posts included Trenton and Belleville. Born in Trenton in 1882 Angus, like others of his age, was to discover first-hand the horrors of the First World War. He and his wife had a son, Farley, who was destined to become one of Canada’s best-known personalities — a curmudgeon, storyteller and gifted writer whose books sold millions of copies worldwide. Among classics in the world of Canadian literature, two titles penned by Farley Mowat are must reads for anyone wishing to better understand wartime. The personal experiences are largely those of Farley during the Second World War combined with the published letters between the old veteran Angus and his fledgling-author son. Together, these accounts provide a rare blend of unclassified wartime information: Farley’s hopes for the future (should he get back home) and the caring observations penned by father. I cannot recommend any too highly And No Birds Sang (1979), and My Father’s Son: Memories of War and Peace (1992). In this special year, I also plan to reread both books as well as the Governor General’s award-winning novel The Wars by Timothy Findley — the story of a young Canadian officer in 1915. With winter reading ahead, I invite you to join me, book in hand, as we remember those who gave us the freedom in Canada — freedom that should never be taken for granted. Not in this or any other year.